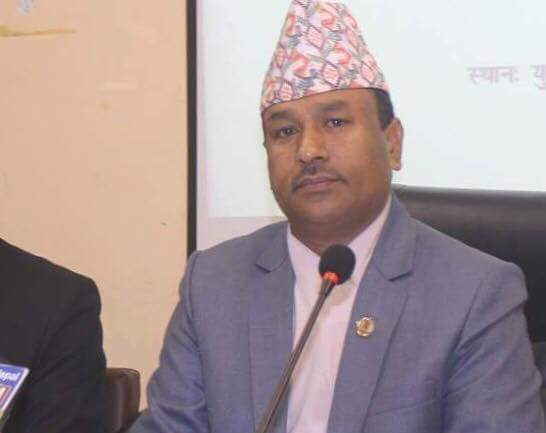 Kathmandu– Minister for Youth and Sports Jagat Bahadur Bishwakarma has said that two parallel associations of a sport cannot exist at a time. At a programme organized in the capital city on Wednesday to congratulate the newly formed office bearers of Nepal Gymnastics Association, Minister Bishwakarma said that the ministry has forwarded the concept of a single committee of a game in the country to avoid the conflict over the sportspersons' participation in the national and international tournaments. On the occasion, Chairman of Nepal Olympic Committee and province lawmaker Jibanram Shrestha said that unity among the sports association results in success and strength. Likewise, Vice Chairman of National Sports Council Pitambar Timsina, who heads the committee formed by the ministry to patch up the conflicting committees of different sports, vowed to manage other sports associations as well in the future. During the event, Chairman of newly formed Gymnastics Association Dhurba Bahadur Pradhan and co-chair Kishor Bahadur singh said that unity in the association was possible thanks to mutual understanding in both the sides and promised to move ahead jointly for the quality promotion of gymnastics.